One of my favourite things about beauty blogging is discovering brands and trying out new products, so when these two rather sleek looking products from Sk:n landed on my doorstep, I was pretty excited to give them a go! For those who don't know Sk:n is actually the country's leading skin clinic, offering specialised treatments spanning from laser hair removal to skin peels. In addition to their treatments, which can be booked at clinics all over the UK, they also have a range of products, designed to help you improve the look and feel of your skin. 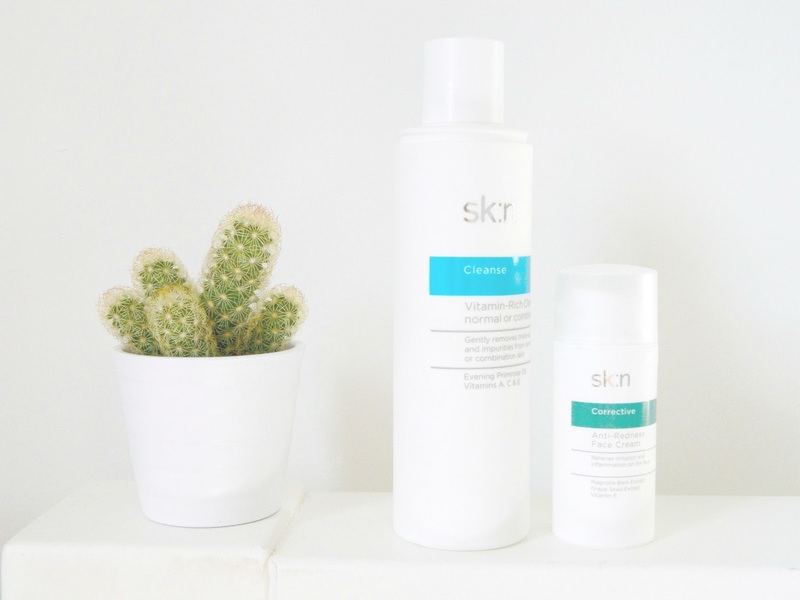 I chose the Sk:n Vitamin-Rich Cleanser for Normal / Combination Skin (£16.75)* and the Sk:n Anti-Redness Face Cream (£28.50)* to try out and I have to say, I've been very impressed! The Vitamin-Rich Cleanser has a lovely creamy consistency, perfect for taking off my makeup and removing impurities at the end of the day. I tend to just pop a small amount on a couple of cotton pads, take my makeup off with it and then rinse my face with water. The cleanser makes removing makeup so easy and leaves the skin feeling lovely and soft. You could use this twice a day, though I tend to use a more refreshing cleansing gel in the morning and then leave this nourishing cleanser for the evening time. Whilst I don't get a lot of redness, I have found that over the last few months (perhaps since falling pregnant) I've had a noticeable amount around my nose. The Anti-Redness Face Cream has therefore been a really handy product to have on my bathroom shelf. I just pump a tiny amount onto my finger tips and then gently massage it around the affected area. I didn't immediately notice a difference, however after using it for a good few weeks, morning and night, the redness isn't nearly as noticeable! All in all, I've been really impressed with both these products from Sk:n. They do exactly what they say they will and the sleek, white packaging is a beauty bloggers' dream. Have you tried any products from Sk:n? June Pawsomebox Review - It's time for a walk!